HP is honored to receive a SmartWay Excellence Award from the U.S. Environmental Protection Agency. The awards were announced today and recognize industry leaders for environmental performance and energy efficiency in their freight supply chain. HP was named a winner in the “Shipper” category in recognition of our efforts to reduce the environmental impact of our supply chain. By decreasing the distance our products travel and shifting to more efficient modes of transport, we have reduced fuel consumption and greenhouse gas (GHG) emissions. A SmartWay Partner since 2007, HP was the first company to receive approval from the EPA to display the SmartWay logo on our product packaging. Today, all HP consumer products are shipped using SmartWay certified carriers in the U.S. Through SmartWay and other projects, we reduced GHG emissions around the world by 170,000 tonnes of CO2e from 2008 to August 2012, bringing us closer to our goal of reducing emissions by 180,000 tonnes of CO2e by 2013 (compared with 2008). HP conducts business in more than 170 countries globally, and ships more than a million products around the world on a typical day. We are committed to reducing the GHG emissions and other environmental impacts related to these activities. 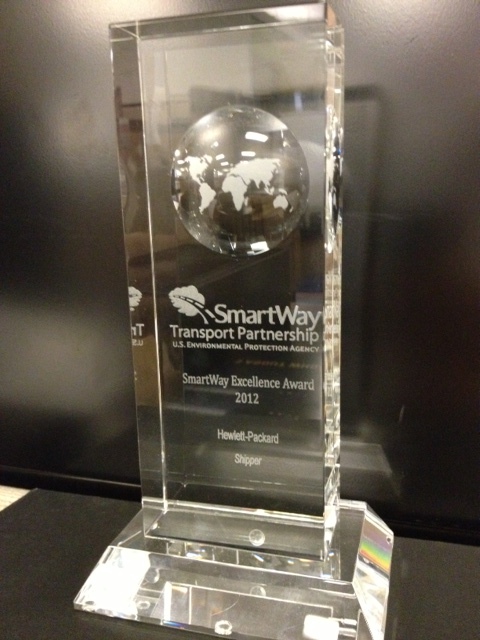 HP was part of a select group to be honored with a 2012 SmartWay Excellence Award. Forty companies, representing less than 1 percent of the SmartWay Transport Partnership’s nearly 3,000 partners, received the distinction. The awards were announced at the Council of Supply Chain Management Professionals annual conference held in Atlanta, Ga.
With a global network of thousands of suppliers spanning six continents and many cultures, HP has one of the industry’s most extensive supply chains, and we embrace the challenge of making the global IT supply chain more environmentally responsible. Our work ranges from collaborating with our materials and manufacturing partners to improve their environmental performance to helping create new standards for overall supply chain management. For example, HP was the first major IT company to publish aggregated supply chain GHG emissions. The EPA launched SmartWay to help businesses improve the sustainability of their freight supply chains. Representing a cross section of the freight supply chain industry, SmartWay partners have saved 55 million barrels of oil. This is equivalent to taking more than 3 million cars off the road for an entire year. More information and a full list of Excellence Award recipients can found here: www.epa.gov/smartway/. Videos from Hewlett Packard Co.